Here you wil find some basic information on burglary/fire (or BF) safes. 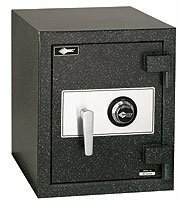 To see what safes we have in stock, please navigate to the main Safe Products	page to view our in-stock safe gallery! The AMSEC BF™ Series offers a unique design that combines all the	security features of a burglary safe and the peace of mind achieved with	a fire safe. The industry’s first U.L. 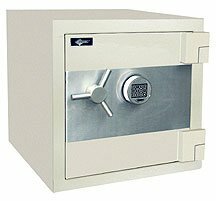 listed, fire rated burglary	safe offers an affordable solution when burglary and fire protection are	an essential part of your buying decision! The best warranty in the business. Lifetime fire replacement and one year	parts and labor. 3-1/2″ thick, consisting of 1/2″ plate steel with a unique proprietary	fire and burglary resistant material. 2-5/8″ thick, consisting of 1/8″ outer and inner steel plates	creating a burglary resistant structure enclosing a unique proprietary	fire resistant material. A full length dead bar locks deep into the body preventing door removal	during a forced entry attempt. 1/4″ heavy duty carburized hardplate. One recessed anchor bolt hole and mounting hardware are provided to securely	anchor safe. Attractively accented with a large chrome-plated dial, matching handle	and a plush velour interior. If your BF safe is exposed to fire and failed to protect the contents,	your BF safe will be replaced free of charge. Just return the safe freight	prepaid to the factory accompanied with the fire report. Contact your	dealer for further details. 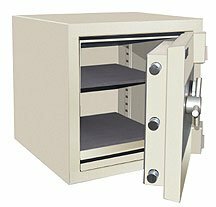 The AMSEC CSC series composite safes are an affordable solution when you want to protect both documents from fire and valuables from burglary attacks. During extreme testing procedures the CSC series safes earned the U.L. (RSC) Residential Security Container burglary label and passed a 1-hour, 350°F factory fire test certification. Overall thickness of 4-5/8″ and is con- structed with a 2″ defense	barrier of outer and inner steel plates creating a single structure enclosing	a unique, high-density fire and burglary resistant composite material. Defense barrier houses a proprietary amalgamation of nuggets and steel	fibers to withstand concentrated attacks with the most sophisticated equipment	used by burglars today. Total protective thickness of 2-7/8″ enclos- ing a high-density burglary	and fire resist- ant composite material with nuggets and steel fibers. One hour, 350°F factory fire rating. Tested at temperatures up to 1750°F. Fire gasket surrounding the entire door jamb. Three massive 1-1/4″ diameter solid steel chrome-plated locking bolts. Three solid steel dead bolts lock deep into body preventing door removal	dur- ing a forced entry attempt. U.L. Listed Type 1 (ESL-10) chrome plated electronic lock standard. Optional	Group II combination lock available. Lock protected by a spring-loaded auxiliary relock device. Heavy-duty 1/4″ drill resistant carburized hard plate with drill shattering	tungsten carbide insert. One internal counter-sunk anchor hole and mounting hardware are provided	to securely anchor safe. Attractively accented with a full width facia panel, matching three point	han- dle, plush velour shelves, back cover and base. Durable and attractive parchment textured finish. * Add 2” to outside depth for handle, dial and hinge projection.